Welcome to the website of the U.S. Commercial Service’s Advanced Manufacturing Team! Our in-depth industry experts help U.S. manufacturers access the best international markets with potential for their product or service. The manufacturing sector in the United States has been a cornerstone of our economy for decades. To maintain this important sector of the U.S. economy, the U.S. Commercial Service provides assistance to increase the industry’s competitiveness by providing insight and research on foreign markets, programs to help U.S. firms enter new markets and services to help them find qualified business partners. 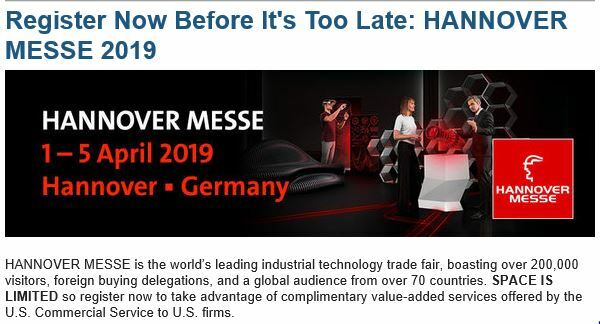 The U.S. Commercial Service is offering exclusive business services to U.S. attendees at HANNOVER MESSE. Use our software platform to expand your opportunities by scheduling meetings with foreign buyers. Take advantage of this unique opportunity to view, qualify and confirm meetings with foreign buyers and potential partners. Request meetings with U.S. Commercial Service in-country experts to learn about the latest market trends and receive industry-specific counseling and strategic advice tailored specifically for your business. Plastimagen Mexico® is an important international business exhibition for the plastics industry in Mexico and Latin America. Hosted April 2-5, 2019 in Mexico City, this leading event will present the latest in plastics technology, products and processing solutions aimed at a variety of different sectors. Plastimagen will present a program of conferences, courses and seminars to demonstrate new ideas and technologies in this dynamic and important industrial sector. 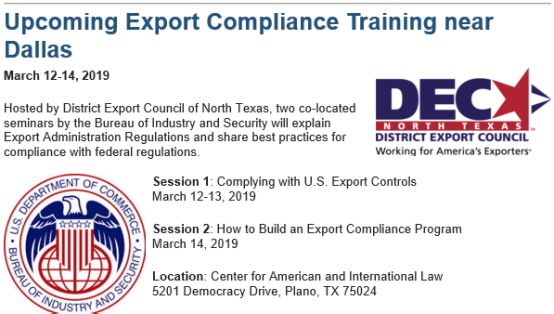 Official certification by the U.S. Department of Commerce, International Trade Administration means U.S. exporters can request customized services from the local industry specialist of the U.S. Commercial Service. Browse trade data snapshots for selected NAICS codes. Additional trade data is available through the TradeStats Express database.